The district level elections held yesterday recorded a depressingly low turnout in some major polling stations in Accra and beyond. 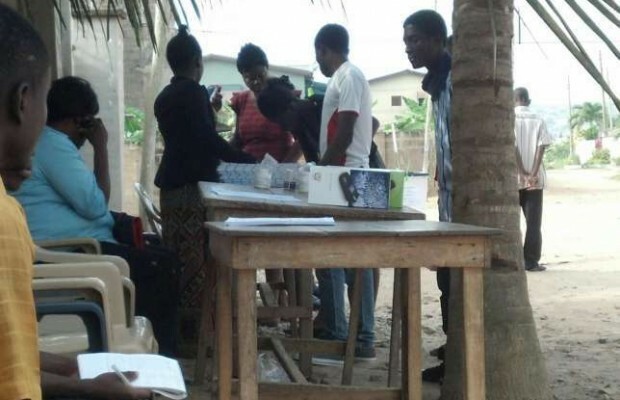 A visit by DAILY GUIDE to several polling centres in the metropolis revealed that just a handful of people were turning up to vote, with some centres managing an average of one person per hour. While the low turnout was a major hallmark, demonstrations and chaos also characterised the polls in some parts of the country. A polling agent at the Bimbilla Senior High School polling centre in the Nanumba North District of the Northern Region was slapped by a voter when the former tried to stop him from voting twice. Reports say that Tahidu Aremeyaw stopped one Adam Hanan from voting for his friend after he (Adam) had cast his ballot. But Adam did not take this kindly. He demanded that he be allowed to vote and gave the polling agent a heavy slap for consistently barring him from voting again. There was no security agent at the polling station at the time the incident occurred. In the Western Region, residents of Kansaworodo in Sekondi-Takoradi staged a protest against the elections. Angered by the last-minute disqualification of one of the aspirants, Nana Adjei, residents took to the streets and set tyres on fire. At the Roman Catholic School polling station, Nima East in Accra, the presiding officer stated that from 7am only 50 out of 926 people had turned up to vote as at 1pm. Officers at Association International School polling centre, Ayawaso West Wuogon, reported that the turnout of voters was low. At the Airport Police Barracks, Burma Camp (B), the presiding officers stated that the turnout was not encouraging. The presiding officer at Prisons 1&2 JHS polling station, Roman Ridge in the Ayawaso West Wuogon constituency, said just a handful of people had turned up to cast their votes. At the Dunia Cinema polling station, Nima West, the presiding officer reported that as at 1pm only 60 persons had turned up to exercise her franchise. Most officers attributed the low attendance to the postponement of the exercise from March 3 to September 1, as well as poor publicity on the part of the Electoral Commission and the Local Government Ministry. Over 18,000 candidates contested in the district assembly elections, made up of 1,102 females and 17,783 males. A total of 43,585 candidates contested the unit committee elections, comprising 12,000 female candidates and 31,585 males. In general, voters across the country displayed apathy towards yesterday’s assembly polls. Visits to a number of polling stations along the Akuapem Ridge and Adentan in the Eastern and Greater Accra Regions revealed that polling stations recorded poor voter attendance. At the Tutu Methodist Primary School polling station in the Akropong constituency, one Kwadwo Ahenkora told DAILY GUIDE that the station received all the necessary logistics for the exercise. He averred that turnout at the station was rather very slow. Kofi Larbi, presiding officer at the Aburi Presby “A” polling station, said voters came in trickles and seemed unaware of what was happening. Eric Yeboah Appeadu, a candidate, blamed the National Commission for Civic Education (NCCE) for the non-sensitisation of the public on the elections. Mr Appeadu said his campaign team and those of his opponents were out in the communities getting eligible voters to come out and vote. He also indicated that the late start of the exercise at the centre made the working population residing in Aburi to leave for Accra and Madina to work. At the Gbantaana Electoral area in Adentan, voters did not come out to vote in their numbers. A candidate in the area, Nana Agyeman Duah, had to withdraw his candidature following intimidation and harassment from the opponents. Isaac Opare Kwafo, a voter at the Brukuase polling station, told DAILY GUIDE that it was unfortunate the manner in which some candidates were engaged in vote buying.